Go to Amoro Jewelry, online at Amoro.com, for fine jewelry with sentiment to last a lifetime. Amoro Jewelry knows that giving jewelry gifts is an intensely personal experience and provides precious jewelry which signifies love, commitment, emotion, and friendship. Amoro Jewelry offers wedding, engagement, and anniversary rings, a gorgeous selection of gem stones, earrings, bracelets, and necklaces, combining beautiful form and functionality, Amoro.com also offers duty free savings on their high quality jewelry gifts. But before you shop, be sure to save with the latest Amoro.com discounts, Amoro Jewelry promotions, and Amoro Jewelry coupon codes, found here at RetailSteal.com. Amoro Jewelry offers international shipping, and provides free shipping in the U.S. See site for further information. Shop online at Amoro.com and enjoy a 15% discount on your purchase. Use coupon code on orders of $500+ to qualify. 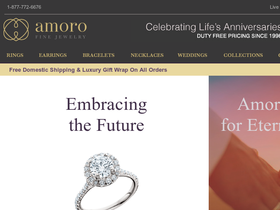 Spend $500 or more at Amoro Jewelry and use this coupon code to save $50. Shop at Amoro and save up to $400 when you purchase a ring. All U.S. domestic orders are shipped for free at Amoro.com. Click here to save on fine jewelry. Shop the Special Savings section at Amoro.com and save up to 50% on rings, earrings, bracelets, and necklaces. Shop now and save. For a limited time, take 50% off this sterling silver heart key necklace at Amoro.com. Click here to view, shop, and save. Shop at Amoro Fine Jewelry and enjoy white gold gemstone anniversary rings for $350. Click here to shop. Use our coupon code at Amoro Fine Jewelry online today to save $100 on purchases of $400 or more. Click link to shop.